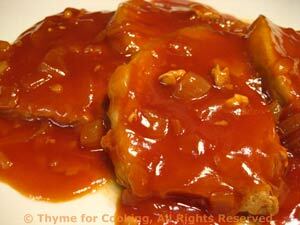 Lemon Soy Glazed Pork Chops, Thyme for Cooking quick recipe. Dinner with an Oriental flavor; spicy pork chops, sesame rice and even the butternut squash lends itself to a quick stir-fry. Something as easy as a bit of soy sauce, some sherry and a sprinkling of sesame seeds can elevate simple Basmati rice to a gourmet level. Melt butter in small saucepan with sesame oil over medium heat. Add stock, soy sauce and sherry. 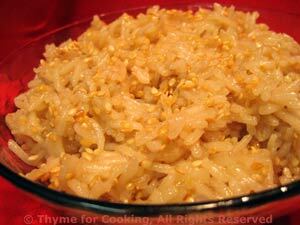 When done fluff with a fork, add sesame seeds, fluff some more and serve. 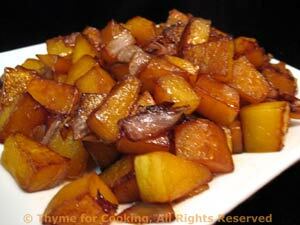 Butternut squash sautéed with onion and soy sauce, another simple preparation for this savory fall vegetable. Slice butternut squash, (.5", 1.25cm) then cut into bite-size pieces. Heat oils and soy sauce in a large, nonstick skillet over medium heat. Add squash, onions and sauté 15 minutes, until squash and onions are nicely browned. Serve.